Removals Spain wide don�t have to be as difficult as they might seem at first, as long as some important factors are remembered. Making a checklist can help immensely with this task. It can also help you identify factors that you may not have thought of before, but which may be vitally important. One such item when organising your removals to Spain is to decide which day of the week might be best for the removal itself. There are pros and cons on all sides, so it should come down to what suits you the best � and when you can arrange a removals team for. Generally, however, the best days of the week to move are Monday, Tuesday, Wednesday or Thursday. 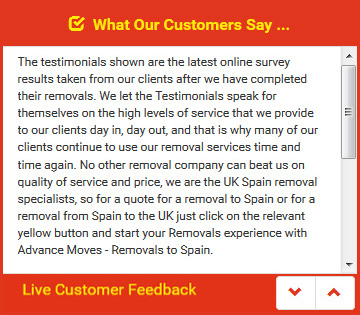 That is because these days are usually less busy for your Spain removals company, so they can be much more flexible regarding timing and working to your schedule. If these are the best days to move, that means that Friday, Saturday or even Sunday have to be the worst. One reason is that these are the most popular days, particularly Fridays. That is because most people work Monday to Friday and seek to book towards the end of the week so that they will have the weekend to start their unpacking and get settled. However, should something go wrong and the move not complete, you�ll probably find that your solicitors and estate agent won�t be open until the Monday of the following week. This can hugely impact on your finances and schedules. When you need to book a date for removals Spain wide, contact Advance Moves for a quote. Our prices and packages include packing, transporting, and packing materials � just see our website at http://www.advancemoves.com/ to find out more. Alternatively, please contact us on 0871 218 0612 or email info@advancemoves.com. We are here to make your move as stress-free as possible.